Cape Town really does have quite a few day walks to experience the sites and and smells of the whole peninsula. On this page I will be mentioning some of my favourite day walks. And tell someone where you are going. Our local newspapers refer to tourists getting into trouble, quite regularly. This reserve is a small reserve slap bang in the middle of the Cape Peninsula.It rather small in South African terms (278 ha), but it has quite a bit to offer. Beside the birds and small animals on view, the main reason I visit this reserve regularly, is that it offers a spectacular view of Cape Town. It lets you orientate yourself and all the places you have been and intend going to. It Should take you a maximum of two hours to walk this reserve. 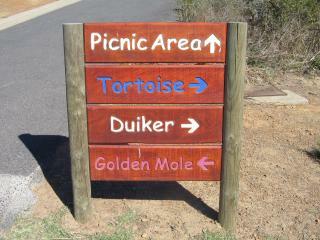 All the trails have animal names and they all start at the entrance gate. Find Komissaris Street in the affluent suburb of Welgemoed in your Cape Town map guide.The road from there is well marked by big, easy to see signs. O yes. It is such a short and easy walk that you will be finished before they become bored. What must I take along? Take something for a picnic - there are a few picnic tables available. You must also remember your binoculars.